SoftExpert Capture is a powerful enterprise software for capturing, processing, validating and managing content. The solution reduces paper handling by turning paper and electronic files into indexed, useful and searchable digital content. The software manages and automates content capture from a hot folder or directly from a scanner, and automatically notifies teams and departments about new content. With automated image processing, document recognition and classification, data extraction and indexing capabilities, companies can add value to the content, speeding up the capture process, reducing errors and increasing productivity. SoftExpert Capture minimizes business risks by meeting requirements established by international standards and regulations such as ISO 15849, HIPAA, FDA, WFMC, DoD 5015.02-STD, MoReq2, ISO 9000, SOX and others. Capture images from TWAIN-compliant scanners. Define hierarchical categories to classify captured documents. Schedule data capture to accelerate jobs and reduce manual labor. Import content automatically from web services, folders or email accounts and improve productivity. Extract metadata from images or XML files. 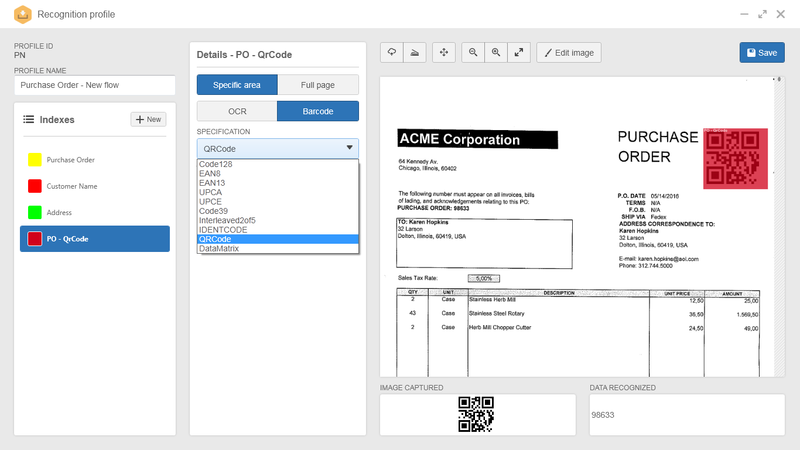 Turn barcode information (Code 128, EAN, QRCode, among others) into indexed fields, streamlining document searches. 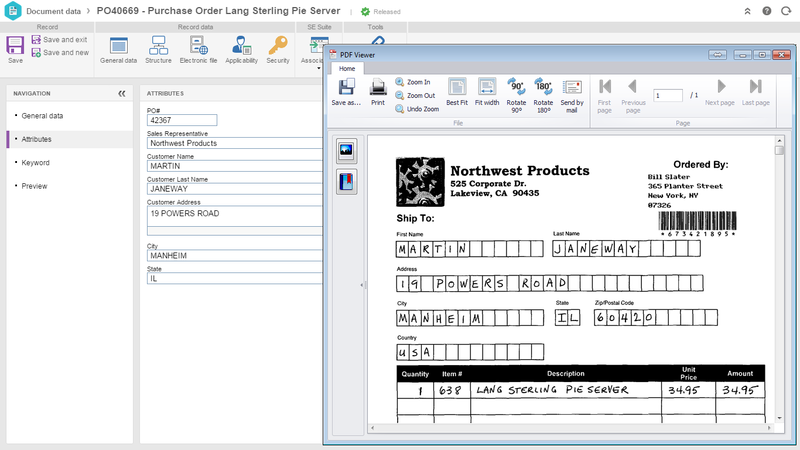 Perform capture throughout the document or through predetermined zones. Fill document metadata by combining external data with information extracted through OCR and barcode. Enable capture process steps like quality control, separation, recognition, verification, indexing and others, according to the document type. Fill in forms (SoftExpert Form) with the captured data. Automatically detect and eliminate blank pages to optimize storage space utilization. Prioritize the capture processes, by tracking past-due and on time to-do tasks. Capture a single document or a high volume of different documents in a complex and multi-departmental capture process. Store files in the database or on distributed servers with compression and password protection mechanisms. 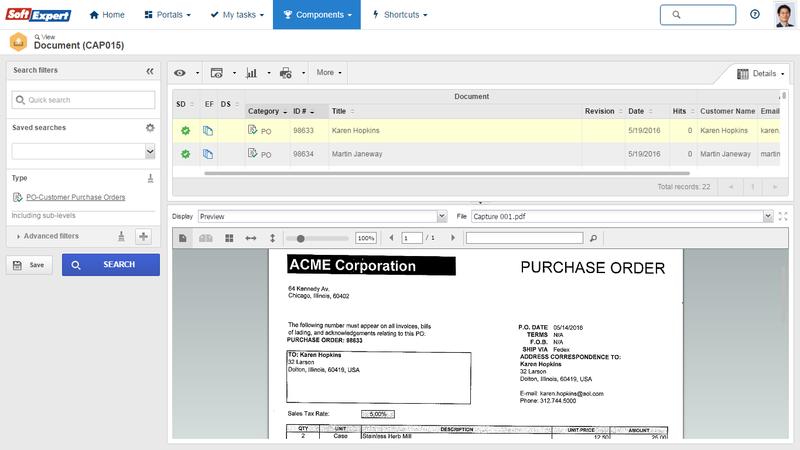 Visualize PDF, TIFF, JPEG, GIF and others documents with the solution embedded viewer. Apply security controls per user, groups, role at category-level (sub-category, etc.) and at document-level itself. Convert the captured documents into images (TIFF, JPEG, GIF) or searchable PDF. Generate productivity reports to track progress and identify bottlenecks in capture processes. Export reports to spreadsheets to easily manipulate data.